In the article I’ll tell you about Killing the killifish myths. It’s incredible the false press and misconceptions that surround killifish. This is really a pity as they are easy to keep and breed. I have kept them for 25 years now and am deeply attracted to these highly coloured characters. I always treat my water to get rid of chloramine, but only for species of killis that thrive in the hard, alkaline stuff that comes from my tap (pH 7.8-8.0). These fish are members of the Nothobranchius genus, many of which originate from Tanzania. There is also a very large genus known as Aphyosemion. Many of them are found in the Congo and Gabon rainforest areas where water conditions are the opposite, namely soft and acidic – similar to our rainwater! My water butts contain water with a pH value of around 6.4, and I have no need to treat it. I do not need a degree in water chemistry to successfully keep and breed my killis. It would, of course, be useful, but I get by just fine. Having established that for most species of killifish the water requirements broadly fall into two distinct types, let’s now look at the temperatures that best suit them. 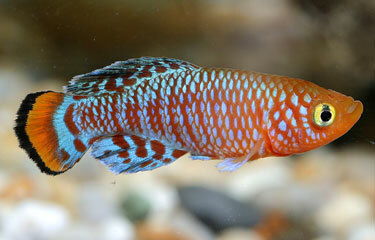 While killifish are found around the globe, they come primarily from Africa and then South America. Both Nothobranchius and Aphyosemion (usually shortened to nothos and aphyos) are from Africa. Nothos hail from the eastern side of this vast continent. They live and spawn in pools that evaporate in the dry season, leaving behind thousands of encrusted eggs. These hatch with the onset of the rainy season. 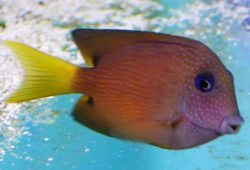 To mimic these conditions, it is best to maintain a temperature of around 25C/77F – a slight variation either way may improve their well-being or induce them to spawn. One British Killifish Association (BKA) member managed to spawn one of these species only when his fishroom heater failed! And it is often the case that a partial water change using water a few degrees lower will trigger spawning. Although I carry out 30% water changes every fortnight for the aphyos and every seven to ten days for nothos, I do not use biological filtration. Others may use sponge filters and the like, but I have never seen the need. Another advantage of keeping killis is that you can house them in small tanks. 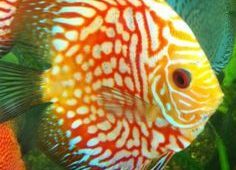 A pair or trio are quite happy in a 30 x 20 x 20cm/12″ x 8″ x 8″ tank with regular water changes. 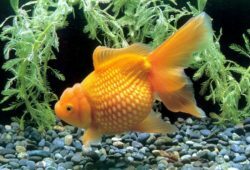 But you do need a larger tank if you go for the species that grow to 10-13cm/4-5″. I use pre-soaked Irish moss peat as a substrate which has none of the chemicals found in multi-purpose peat composts. By soaking it first, much of the tannin leaches out. Squeeze well to get rid of most of the dark brown water. In small tanks, two or three handfuls should be plenty. I always use spawning mops and/or plants. These can be placed on the tank bottom or attached to a block of polystyrene or a cork so that it floats on the surface. There is no need to remove the parents after spawning. But if you prefer, you can place the eggs on some damp moss peat in a small container, such as a margarine tub. After 16 days, add water similar to that in which they were spawned. When hatched, the fry can be fed a small amount of liquifry and infusoria before moving onto newly hatched brineshrimp. The shrimp can be fed (sparingly) for a long time. My adult fish never tire of them. These do not need spawning mops. However, as the males can be hard drivers, it’s not a bad idea to provide a non-floating mop as a refuge for females. If nothos are well fed and subject to partial water changes, they will spawn most days. They deposit their eggs in the peat substrate, and can stay in the same tank for three to four weeks. Then transfer them to an identical set-up. Remove the peat from the first tank and strain it through a net, squeeze, then place on newspaper to dry until it resembles pipe tobacco. Put it now into a polythene bag labelled with the species name, date of drying, and the date that the peat can be wetted – this last depends on the species and the temperature at which they are stored. Some species stored at 27C/80F will hatch after four or five weeks; others may take four to five months. It is exciting when you get around to wetting a bag of peat. If your fish spawned well and the eggs were stored at a high enough temperature, you may have a few hundred fry. On the other hand, you may find just a couple. All is not lost as you can re-dry and store the peat and try again in a few weeks. A very small percentage of eggs will stop development and enter a phase known as diapauses. This is when all development of the fry stops, yet the egg remains viable for ten or more years. Some believe this is nature’s way of ensuring that a species survives should the rains fail to arrive, or in a prolonged drought. In my experience, most killis need live foods. Many people offer Daphnia, mosquito larva and bloodworm. Some killis will take these frozen, but this does seem to be down to the individual. and potential outbreaks of Velvet disease. Grindal and white worms are eagerly taken, as are freshly hatched brineshrimp, the latter of which is a good food for fry and adults. Killifish are seldom found in dealer’s tanks. If you are lucky enough to find some, they are usually of a few distinct varieties.